The pattern for these light summer socks has been generously donated by long-time p/hop supporter and designer extraordinaire Ros Clarke. 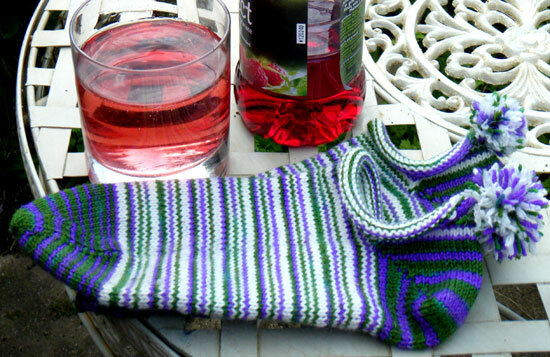 These footlets make lovely summer socks, especially if knitted in yarn with some cotton, bamboo or tencel content. The stripe pattern works best if the solid yarn (CC) is a neutral background colour and the main yarn (CC) is self-striping or variegated. It would also work well as a way of using up scraps of self-striping yarn. To see what others have made from this pattern, please visit the Wimbledon pattern page on Ravelry. There’s a fun cricket tea cosy and Can(tab) socks.